With so many activities and restaurants to visit while on Maui, I thought it would be good to start my own little “Maui Restaurant Reviews”. I have already posted my favorite Maui Restaurants, but this series of posts will focus on individual Maui Restaurants and why, they are so good! When on Maui, a must-do activity is a day trip to Up Country! The views alone are worth the trip and there are a lot of fun activities, tours, shopping and eating options on the slopes of Haleakala. One of my all-time favorite restaurants on Maui happens to be on the way up, The Hali’imaile General Store. The Hali’imaile General Store (restaurant) has been owned and operated by Maui’s own, Bev Gannon since 1988. It is her most award winning restaurant and I know why….it is amazing! The restaurant itself is in a beautiful setting. It is bright and tropical on the inside. The menu offers so many delicious options; I have yet to try something I didn’t love! I personally love to go for lunch (tip: you want to be there for the daylight hours to see all of the beauty of the restaurant and up country). Some menu items you must try are: The Sashimi Napoleon: Ahi Tuna Sashimi, Smoked Salmon and wasabi vinaigrette layered between crispy won tons. It is simply wonderful! 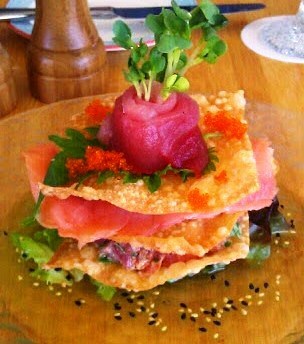 The Sashimi Napoleon melts in your mouth. As if those dishes are not enough, you also must try the Pineapple Upside Down Cake (the four of us devoured this cake in 30 seconds flat!) Made with Maui Gold pineapple (sweat enough on its own) and a decadent butter cake this dessert is topped with whipped cream. I dream about this dessert! You can usually walk in for lunch and dinner reservations are always recommended. Hali’imaile General Store is located at 900 Hali’imaile Road, Makawao. It is open for lunch Monday- Friday, 11am-2:30pm and Dinner nightly from 5:30-9:00pm. Check out the Hali’imaile website for more details.